Downtown Disney is a great place for shopping and dining. With what seems like an endless amount of stores and restaurants, there is something here for everyone. Located in the Downtown Disney Marketplace at Walt Disney World is a restaurant that I am asked about quite frequently, which is T-Rex. This is especially popular among those with children, and it’s not hard to see why! T-Rex is not just a restaurant, but also an experience. 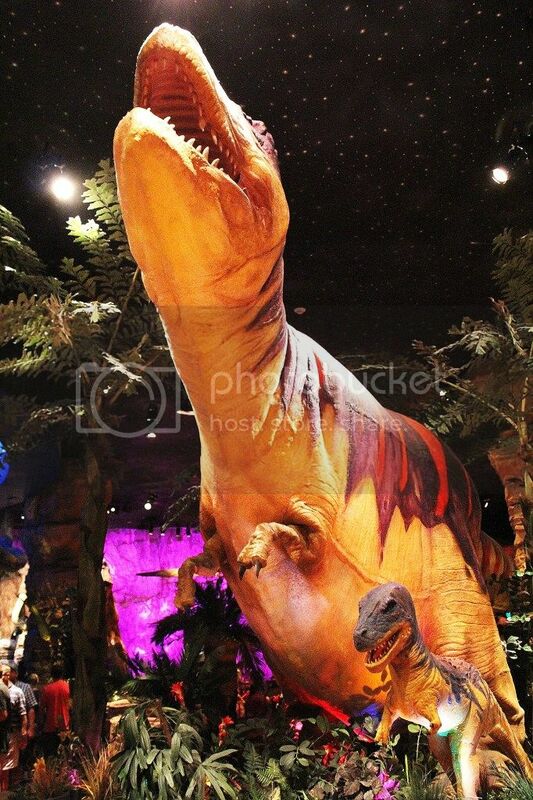 One of the first things guests notice when entering the restaurant is the giant prehistoric creatures that make T-Rex their home. Pterodactyls, larger than life jellyfish and a gigantic octopus hang above guests’ heads. Be sure to keep your eyes on the octopus as he’s got his eyes on you! 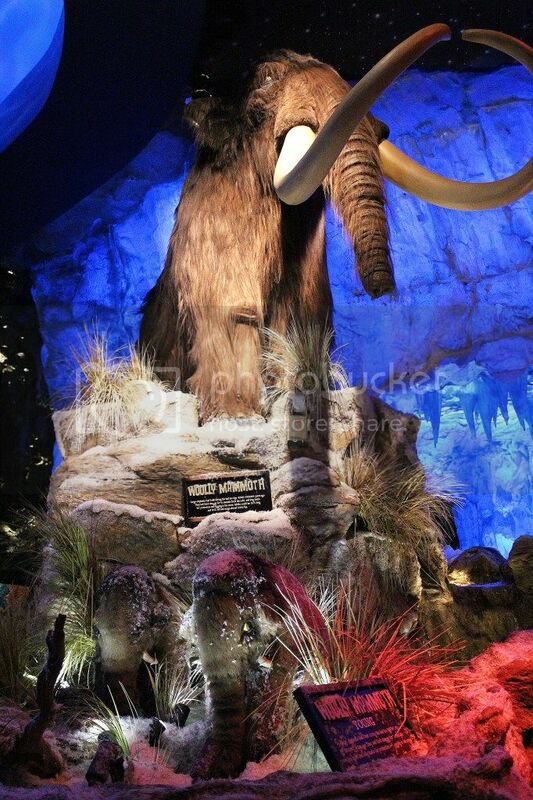 A Woolly Mammoth family sits outside of the ice cavern, in which guests can dine (at room temperature). And what would a restaurant called T-Rex without, you guessed it, a Tyrannosaurus Rex?! This big guy stands 15 feet tall front and center! Among these animals, many other types of dinosaurs can be found throughout the restaurant. Just about every 20 minutes the lights go down and the noise goes up and a meteor shower takes place. Meteors shoot across the sky while lights of fire and loud rumbles turn the restaurant into quite a lively place. The prehistoric animals tend to get a little crazy too, sounding off with roars and growls. It can be a bit intense for little ones, however they don’t last long. While the meteor showers and the animatronics are really awesome, the real reason people come here is for a meal. T-Rex serves both lunch and dinner, with the same menu for both. The menu is full of choices that can make the whole family happy. To start, appetizers such as the Artifact Stack (onion rings with BBQ ranch and buttermilk ranch dipping sauces) and the Pterosaur Wings (buffalo wings) are a great way to kick off a meal. I ordered the wings on my last visit and they were delicious! Brachiosaurus Bruschetta, T-Rexadillas and Colosso Nachos are some other fun choices as well. The soup menu offers both Asterois French Onion Soup and the Lava Tomato Basil Soup. There are also several salads to choose from. With over 25 entrees, you’ll be sure to find something to stomp that roar in your stomach. For the pasta fans, try the Mammoth Mushroom Ravioli, Layers of the Earth Lasagna or the Triassic Tortellini. Looking for seafood? Guests can choose from Fossil Fish-n-Chips or Jurassic Shrimp Skewers, just a couple of items on the seafood list. Carnivores can find entrees like the Neanderthal New York Strip, Primitive Pot Pie, Cretaceous Chicken Fried Steak and the Tyrannosaurus T-Bone to dig into. Guests looking to enjoy a burger can get the Guac-asaurus Burger (topped with guacamole, lettuce, tomato, Pepper Jack cheese, bacon and a fried onion ring), or the smaller Bronto burger. The Stegosaurus Steak and Cheese sandwich, Pork-asaurus sandwich and the Paleonzoic Chicken Sandwich are available for those wishing for a lighter meal (or just saving room for dessert). Speaking of dessert, T-Rex’s dessert menu, cleverly titled “The End is Near!” can satisfy any sweet tooth. Meteor Bites are chocolate and vanilla donut holes, powdered with sugar and served with caramel and chocolate dipping sauces are delicious (I can speak from experience). The Cosmic Key Lime Pie, Sorbet Sampler and Ice Age Indulgence (layers of ice cream sandwiches topped with fudge sauce, whipped cream and crumbled Heath Bar) are great ways to top off any T-Rex meal. However, there is one dessert that is hard to miss. Take a huge piece of chocolate fudge cake, pile it with ice cream, whipped cream, drizzle with caramel and fudge and top it off with crumbs of Butterfinger and voila – you’ve got yourself the Chocolate Extinction! This dessert is big enough for the entire family to enjoy. Are you drooling yet? While the meal may have ended, the fun doesn’t have to! After guests have finished dining, they can browse the Dino-Store where they can find the perfect souvenir for any Dino enthusiast. Build-A-Bear Workshop has brought their business into town so guests can create their own prehistoric pals at Build-A-Dino! For the future paleontologists in your group, make a stop at Paleo Zone where they can dig, dig, dig and discover fossils and dinosaur bones. Have you dined at T-Rex before?